ART. ENTERTAINMENT. THEATER. FILM. LITERATURE. BOOKS. FASHION. PAGEANT. TECHNOLOGY. FOOD. SPORTS. Since 1954, Pioneer has been in the service of insuring Filipinos and the things they value most. Through the decades, it has also found inspiration through the arts, and has supported the artistic community through insurance coverage and sponsorships. 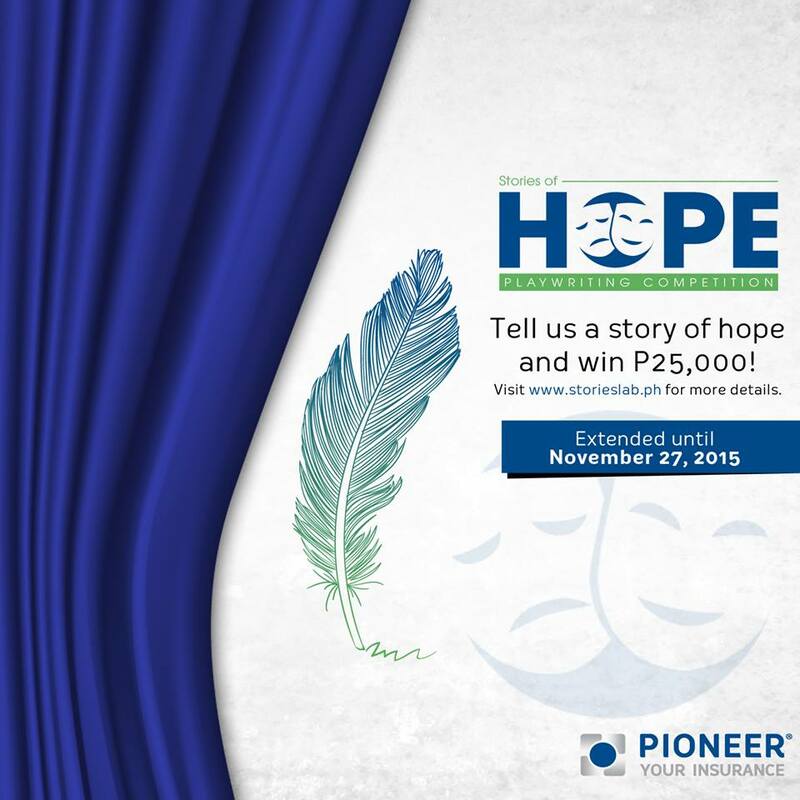 As a means of continued support for the Filipino talent, Pioneer announces Pioneer Stories of Hope Playwriting Competition. The campaign paves way for fresh ideas from young, aspiring playwrights who have ‘hope-full’ stories to tell. Whether the stories are about Filipino resilience or being positive despite challenging situations, college students nationwide are invited to share them through a one-act play that can be written in English, Filipino, or Taglish. Submission of scripts is from September 01 to November 06, 2015 (extended until November 27, 2015). The winner will be announced on December 14, 2015. A P25,000 cash prize plus insurance coverage from Pioneer await the winning entry. Visit www.storieslab.ph for the complete details of the competition. Pioneer, an established life and non-life insurance company in the country, has always been inclined to the arts through sponsorships, coverage, and promotions of cultural events. In fact, the group has covered theater plays such as Miss Saigon, The LittleMermaid, and Trumpet’s N.O.A.H. Last year, Pioneer rolled out the Stories of Friendship Video Competition that encouraged participants to share their take on friendship through a three-minute video. Ateneo de Davao’s My Friends Who Ran took home the first prize. Consistent with its passion for the arts and belief that it stirs creativity and innovation, Pioneer has tapped Virgin Labfest 11, an annual playwriting competition organized by Tanghalang Pilipino, Cultural Center of the Philippines (CCP), and Writer’s Bloc, Inc.
Out of the hundred entries submitted, 12 unpublished and untried plays were chosen to be staged at the CCP from June 24 to July 12, 2015. Meanwhile, Juan Miguel Severo’s Hintayan ng Langit received the “Pioneer’s Choice” recognition for its excellent portrayal of hope. “Pioneer has always been inspired by the arts and with this, we are honored that Tanghalang Pilipino, CCP, and Writer’s Bloc, Inc. have partnered with us in our Stories of Hope campaign,” said Pioneer Marketing Head Len Pozon. To further give recognition to these exceptional stage plays and playwrights, Pioneer has organized the Virgin Labfest Campus Tour. The winning plays will be showcased to select universities and colleges in the Metro and an open forum with their respective directors and playwrights will take place to address questions from the audience. For inquiries, feel free to call Kris Caturay of Digital Marketing at (02) 812-7777 local 455. Rejected UPCAT Essay Questions: Can you answer these? Film Devt. Council of the Phils. Art Blogger was born in Manila; currently living in Parañaque City, Philippines. He is a teacher, writer, blogger, editor, proofreader, translator, calligrapher, abstract artist. A proud graduate of De La Salle University (Manila). A very passionate advocate for the Visual, Literary, Music, & the Performing Arts. He loves teaching, painting, drawing, design, typography, calligraphy, reading, singing, theater, film, blogging, literature & writing poetry & essays. Follow him at @ronivalle (Twitter/ Instagram/ Pinterest), Googleplus.com/+ArvinEllo and subscribe to his "Pintura Channel" on Youtube. VINTERSECTIONS.COM. Picture Window theme. Powered by Blogger.